I recently did the decorations for a women's meeting at my church. The purpose of the meeting was to welcome in the Christmas season and the program focused on the Savior. It was wonderful night and I must say, I had a lot of fun doing the decorations. 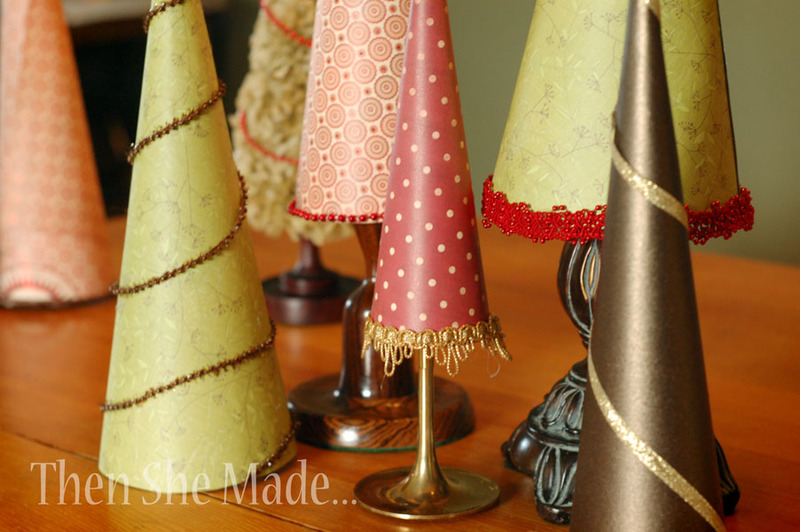 A few of my friends have asked me how I made some center pieces so I thought it was easiest to show the steps here. These trees are another one of those crafts that you've probably seen online in various places. In fact, if you go into Hobby Lobby you can buy them pre-made in various sizes and patterns, however, making them is way more fun and easier on the pocket book. Step 1: Start at one corner of your paper and begin to roll. You want to keep the paper rolled really tight at the corner but it can be as lose, or as tight, as you want further down. 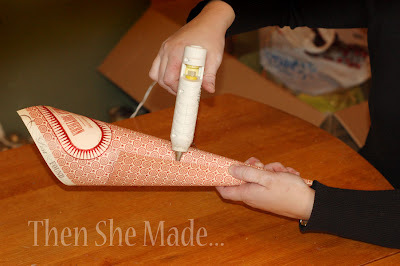 Step 2: Once it is rolled how you want it, add a little hot glue along the exposed edge of your paper and seal the cone closed. You could use other adhesives but I like hot glue because it's fast. With regular glue you have to sit and hold the paper until it dries - ugh, that's a pain. Step 3: Now that the paper is rolled and glued together you need to trim off the ends. Start cutting where the two edges cross over each other, see photo above. Then, cut all the way around the paper until you have a flat, even base like shown above. Step 4: Next you just need to decorate your tree. 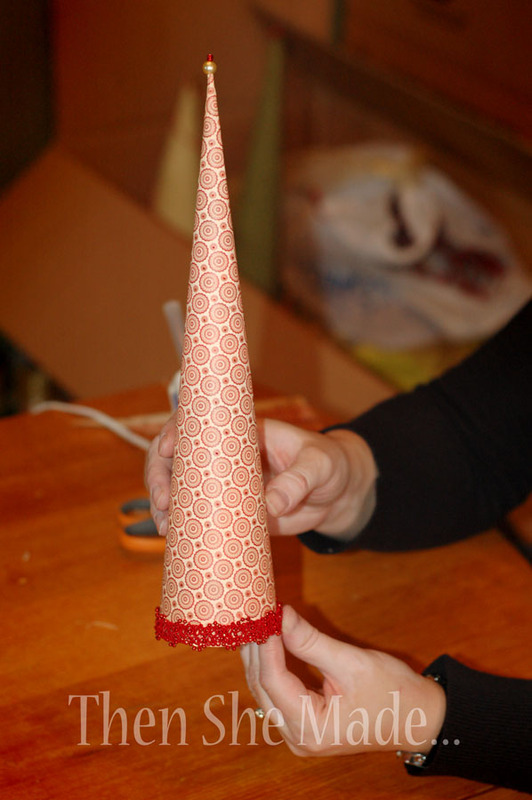 Trim it with ribbons, tassels, or beads along the bottom and top it off with a bead or two on the top. You could use a little wooden star on top too, that would be cute. You can totally be creative with the trimmings, add a little or a lot. Plus, it's fun to use a lot of different styles of trimmings. Check Hobby Lobby for rolls of trimmings, they are usually 50% off. If you don't have a Hobby Lobby near by, go to Warmart. You can buy it on the roll or have it cut by the yard there. 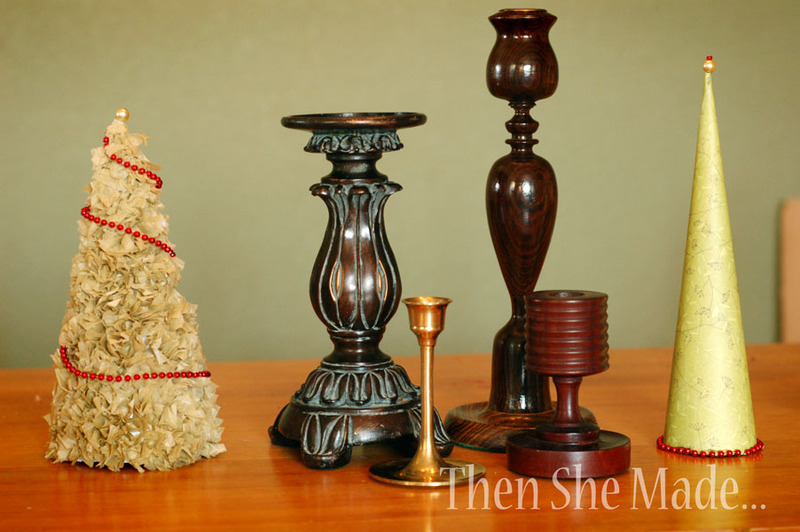 Step 5: Once you have your trees all completed, gather some candlesticks. This is optional as the trees can stand on their own. 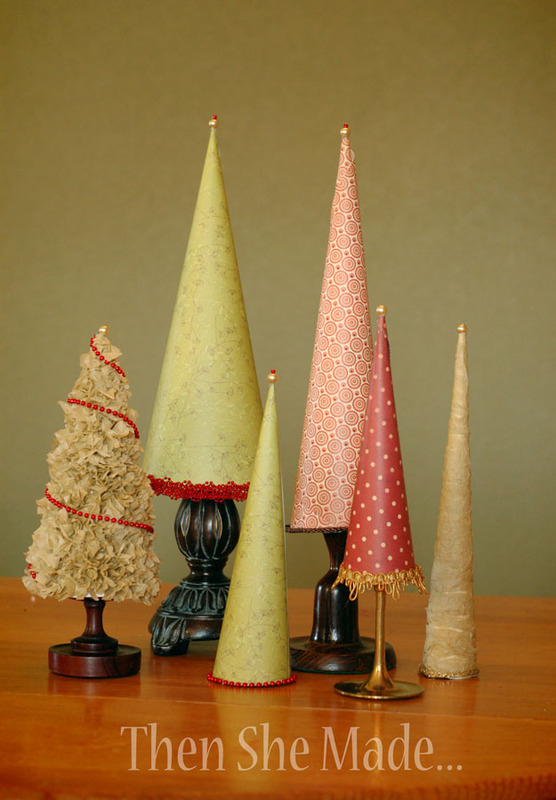 However, putting them on the candlesticks will add a nice touch to your project, plus if you plan to make a grouping of trees, it will help to give height to your set. So, that's it. Simple, simple, simple! Oh, and the tan tree on the left that looks fluffy, it was easy to make too. 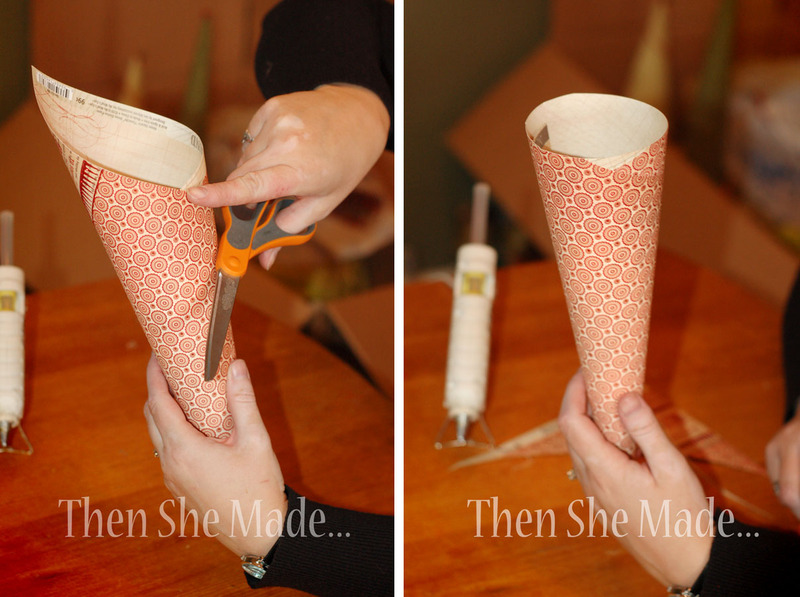 Start by making a cone just like the steps above. Then, take some tissue paper and cut it into small 1 inch squares. Then roll those squares over a pencil eraser, dip in glue and then glue to your cone. It is time consuming but I like how it looks. I am so glad you did a tutorial for these! I love them! Thanks so much for sharing! Thanks for the tutorial. I'll have to make some of these! These are beautiful! I saw these pinned on Pinterest and had to stop by. Oh I love this cute idea.... so festive and not to difficult!